1. Mix the green chillies and coriander leaves. 2. Grind to a fine consistency with 2 tblsp water. 3. Whisk curd with salt till smooth. 4. Add the ground paste and keep aside. 5. Heat ghee for tempering and fry the remaining ingredients. 6. Stir it into the spiced curd. 7. Serve as part of a meal. 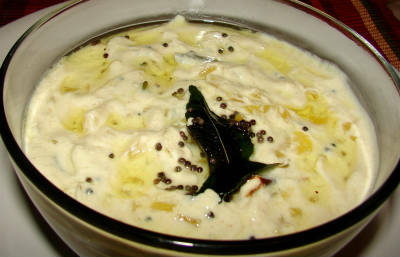 Feel free to comment or share your thoughts on this Pachaimilagai Kothamalli Thayir Pachadi Recipe from Awesome Cuisine.